The Colonnade Street runs through the center of Petra proper, with many un-excavated sites on either side. It follows the standard Roman pattern of an east–west decumanus, but without the normal cardo maximus (north–south axis). The remains of colonnade street in city proper, Petra, looking towards the arched gate. It leads from main theater to the Qasr al Bint (visible in the background), the ancient shops that once flanked this avenue are gone or are in ruins. The street represents an original Nabataean creation,later refurbished during the period of Roman occupation. It would have been one of the principal shopping streets of ancient Petra. The street was rebuilt in 106 BCE with a width of 6 meters. Standing in front of the great temple (stairs to the right lead to the temple entrance) view towards the royal tombs. This is believed to have been the heart of the city and center of various types of commercial activities and transactions during the third century BCE. The street continued to be used throughout the Byzantine period during the fourth and fifth centuries, until the sixth. The street was paved in horizontal and vertical ways in order to facilitate the movement of vehicles as it curved from the middle to allow the draining of water, which is equipped with a network of channels under the street level. Hardrian's Gate also known as Temenos Gate, view from outside the gate towards the Roman Cardo. The remains of a monumental door, with three arches, decorated on both sides with sculptures, carvings and niches built around the second century CE. It was ornamented with sculptures, carvings and niches with statues that merged elements of the Hellenistic-Roman culture with that Nabataean. The excavations indicates that there was an older road with 1-2 floor building, lying on its side. On the left of the portico street to the south, there is a set of stairs that leads to the courtyard, which is called the market. 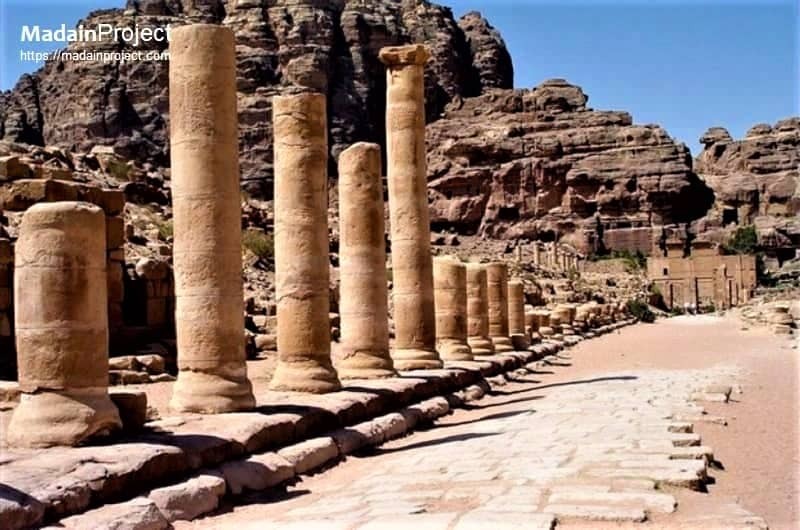 During the past centuries, frequent flash floods have left the Colonnade Street of Petra virtually vanished, along with most of the central Petra. The Nabataean temple of Qasr al-Bint is standing within a large paved temenos to a height of 23m. it is surrounded by a peribolos, an enclosure wall, to which seats were added during the time of King Aretas IV (9 BCE - 40 CE) according to two inscriptions, one of which is still engaged between the seats. Situated just outside the Temenos Gate the view of Qasr al-Bint; looking south across the altar to the porch of the temple. The temple's cella is located behind the central arch. The Temple of Winged Lions is a Nabataean religious building situated prominently on the north slope of the Wadi Musa (Moses’ Valley), overlooking the ancient city center of Petra. The Winged Lions Temple, was dedicated to the God of Lat and Uzza, who is the mate of the major Nabataean gods. The temple was discovered in 1973, and since 1974 excavation at the Temple of the winged lions became a major part of the activities of the American Expedition to Petra, directed by Dr Philip Hammond from Utah University. The remains of the Roman era Nymphaeum are at the beginning of the colonnaded street at Petra. It was situated at the confluence of two watercourses, dedicated to the water nymphs and was probably one of the improvements made to the city after the Roman annexation. It is a semi-circular public fountain near the junction of Wadi Musa and Wadi al-Mataha and six Nabataean columns decorated the façade. Virtually nothing remains of the ancient superstructure, and even the retaining wall is modern.